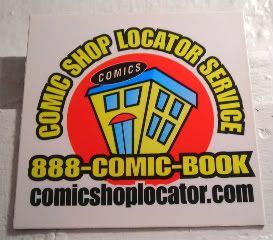 Eeeep, we missed Free Comic Day yesterday, which was part of why I had this comic shop locator magnet with me. Oh well. To make up for it, we did end up going to see Wolverine today. It wasn't as bad as I thought it'd be, but wasn't as good as I was hoping. Plot was a bit off, SFX were a bit up and down, fight scenes were ok - but, for gratuitously shirtless Hugh Jackman and pretty-boys Taylor Kitsch and Ryan Reynolds? Yeah, I'll sit through it, sure. Stupid Mrs. Reynolds. Didn't they get the memo? After Alanis, *I* was next in line.